From Fortune 500 corporations with thousands of employees, to small companies with giant hearts, partnering with World Vision helps make a difference – for your bottom line, for employee engagement, and for families in need around the world. Helping children around the world achieve their dreams through partnership with World Vision since 1986. “There’s no question that working with the world’s largest NGO — the credibility that World Vision brings, as well as its reach and history of working in underdeveloped communities — brings a great advantage to us. When you bring the power of World Vision together with the power of Microsoft, we can do great things.” —James Bernard, Global Director, Strategic Partnerships, Microsoft in Education. Saving lives through clean water through partnership with World Vision since 2007. “Let me say how grateful I am to both P&G, one of the greatest companies in the world in terms of its responsibilities to society…and to World Vision, one of the great treasures of NGOs…The fact that they’re doing this together means a lot to me.” —President Bill Clinton. Providing clean water on two continents through partnership with World Vision since 2004. Building up women’s spirits with a groundswell of support through partnership with World Vision since 2014. “In our first year of partnership with World Vision, we were thrilled to engage our Thirty-One family to bless thousands of women across the U.S. with essential hygiene items, but more importantly, with hope, encouragement, and a boost of self-confidence.” —Cindy Monroe, Founder, President, and CEO, Thirty-One Gifts. There are many ways to support World Vision in the fight to ending global poverty. World Vision’s corporate partners create engaging campaigns to raise awareness of poverty and provide financial support to help those in need. 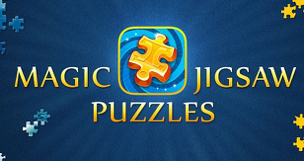 Join the Magic Jigsaw Puzzles Community and give the gift of health! For every purchase of a puzzle pack marked with the World Vision logo through the end of July, Magic Jigsaw Puzzles will donate $2 to support World Vision’s Mother and Child Health programs that focus on the critical first 1,000 days of a child’s life. For every 5 gallons of water purchased at participating Watermill Express locations through 12/31/17, Watermill Express will donate funds to provide 5 gallons (one day’s worth) of clean water to a person in need.